Concern inside the U.S. military that Afghanistan is not going to end well is heating up. It's always been simmering, but now seems to be coming to a slow boil. Lately, at least in private conversations with officers up and down the chain, the concerns are becoming louder. "There is no endgame and there hasn't been one from the start," says a U.S. general and war-fighter. "There's all this talk about how we can't pull out, because if we do all the blood we spilled will have been wasted. Didn't we learn this lesson in Vietnam?" There are several factors piled atop one another here: President Obama has declared the U.S. is pulling out by 2015, and, in fact, the pullout already has begun. Claims of progress – repeated anew last Thursday by Defense Secretary Leon Panetta and Admiral Mike Mullen, chairman of the Joint Chiefs – have been buffeted by high-profile Taliban attacks and assassinations, in Kabul and elsewhere, in recent months. Late Sunday, an Afghan employee at the CIA's main post in the capital shot and killed one U.S. citizen and wounded a second -- both likely agency operatives -- before he was killed. General Dave Petraeus, architect of a reinvigorated Army counter-insurgency strategy and, until recently, the top U.S. commander in Afghanistan, has retired from the service and begun work as a civilian running the CIA. Military commanders are not mere cogs in a war machine; Petraeus' departure from the battlefield carriers an unknown, but real, cost to the U.S. effort. Finally, the troops themselves are sounding more pessimistic. In an annual – but unscientific -- poll conducted by the independent Military Times newspapers, the share of troops that feels the U.S. will prevail in Afghanistan has fallen from more than 75% in 2007 to below 50% now. Pentagon leaders feel generally good about how the war is going. 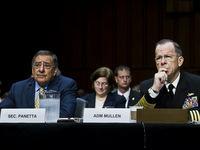 "While my overall assessment is that our effort in Afghanistan is headed in the right direction, I think we also have to be clear-eyed about the challenges that remain," Panetta told the Senate Armed Services Committee last Thursday. "I believe the security situation is steadily improving," Mullen said in his final appearance in uniform before the committee (he retires at the end of this week). Panetta said the high-profile attacks are simply the result of the U.S. and its allies putting so much pressure on the Taliban that they are lashing out with spectacular attacks that may make news but are militarily insignificant. Such events are the "result of a shift in momentum in our favor, and a sign of weakness in the insurgency," he said. Yet as a chart (click on it to enlarge) released last week by Anthony Cordesman in a report on Afghanistan's future makes clear, the U.S. has invested little to prepare Afghanistan for a better future once U.S. troops pull out. Bottom line: of the $386 billion spent by U.S. taxpayers on Afghanistan over the past decade, $373 billion – 97% -- went for military goods and services.